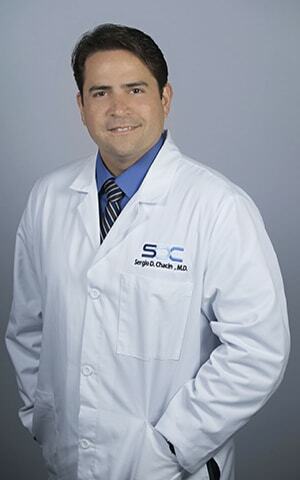 Dr. Chacin is a Board Certified Physiatrist, fellowship trained in Interventional Spine and Pain Medicine. He completed an Internal Medicine Internship in St. Louis, MO. at St. Mary’s Health Center. He then moved to New York City, where he finished his training in Physical Medicine and Rehabilitation at Metropolitan Hospital Center, an affiliate of the New York Medical College, where he also served as a Chief resident of the residency program. His experience includes serving as an Assistant professor for Penn State College of Medicine and Attending Physician at Hershey Rehabilitation Hospital in Pennsylvania, where he treated patients with stroke, multiple sclerosis, traumatic brain injuries, spasticity, multiple trauma and other disabling conditions. Dr. Chacin speaks fluent Spanish and his main interests include chronic and acute pain involving neck, lower back, joints, headaches as well as other degenerative conditions. He focuses his treatment plan using multiple modalities, including Interventional techniques, medication management, physical therapy, bracing, and life style modifications, among others.